This chilled, summery soup is the perfect way to cool down and refresh. It's full of the season's two best (in our opinion) kinds of produce: strawberries and tomatoes. We recommend enjoying this super fresh dish on a warm, clear summer night in a backyard. No two gazpachos are ever the same. Here, chefs riff on this classic Spanish soup that just screams summer. To add an extra layer of flavor (and, perhaps to make gazpacho taste more like a bloody Mary), TV star Andrew Zimmern adds this savory condiment along with lemon juice and Tabasco. Prolific cookbook author, Steven Raichlen sets vegetables directly on hot coals to infuse them with a smoky flavor before pureeing them for gazpacho. NYC chef Shea Gallante uses sweet yellow tomatoes for his luxuriously smooth gazpacho before topping it off with lobster and avocado. TV chef Katie Lee uses the sweet heirloom tomatoes known as Green Zebras in her gazpacho and adds avocado to make it creamy. 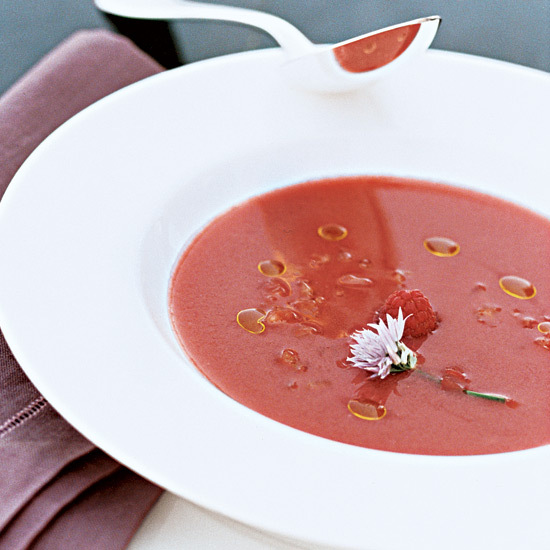 Watermelon sweetens the refreshing gazpacho from chefs Gabriel Frasca and Amanda Lyndon. For his refreshing, early summer take on gazpacho, Spanish chef Adolfo Munoz blends in fennel and strawberries.